The Young and Well CRC is an international research centre, based in Melbourne, that focuses on the role technologies can play in improving young people’s mental health and wellbeing. Young and Well CRC is also a leader in workplace health and wellbeing. In 2014, they publicly released their innovative and comprehensive wellbeing policy, with the aim of supporting other organisations to prioritise wellbeing in the workplace. In this guest post, Rose O’Sullivan, Young and Well’s HR Advisor and Operations Support, shares why they love one particular initiative from their wellbeing policy – the walking meeting – and why you should bring walking meetings into your organisation too. As an institute conducting research into the health and wellbeing of young people, the Young and Well CRC is passionate about putting research into practice. Research into workplace wellbeing continues to show important insights for organisations, including a 2014 report from Price Waterhouse Coopers (PwC) as part of the ‘HeadsUp’ initiative created by The Mentally Healthy Workplace Alliance. The research estimated that the impact of mental health conditions on productivity, participation and compensation claims costs Australian businesses a whopping $10.9 billion annually. The Young and Well CRC firmly believes in providing a healthy workplace environment, and has developed a wellbeing policy as a commitment to the mental and physical wellbeing of team members. One of our favourite initiatives in this policy is the walking meeting. A walking meeting is much the way it sounds! Team members leave the office to take a relaxed stroll around the streets or a nearby park, and discuss agenda items and various topics as they walk. Walking meetings give team members the opportunity to take a break from the office environment, get some fresh air and physical activity, all the while maintaining productivity. Walking meetings usually work best with two to four people to allow for easy communication. The meetings are sometimes a quick ten-minute walk around the block, or a longer walk for an hour or more. Note-taking apps on smart phones, or pen and paper are used to document key actions from the meeting. Walking meetings are a very practical way to break up a long day of sitting, and taking a break from the desk while being productive. Movement throughout the day is of huge importance to physical wellbeing, with prolonged sitting being identified as a major health issue for the workplace. Quite staggering research by Comcare Australia shows that sedentary behaviour is in fact a risk for cancer, cardiovascular disease, type II diabetes and early death – even when people engage in daily exercise. Research suggests taking a one to three minute break every half-hour during the day to stand or walk around. Regular breaks from sitting are essential for good health, and walking meetings are a great opportunity to do this. Our experience has shown walking meetings to have a very different dynamic from sitting in an office meeting room. Feedback from the team has been that the meetings are more relaxed, informal, good for generating ideas and problem solving, and are often more engaging. We have found that the change in environment can help team members move into a different headspace, stimulate creativity, and open up their thinking. Having a walking meeting instead of an office meeting needs to be optional, to allow for personal preferences or needs, and it’s important to be sensitive to these. For example, team members with a physical disability may prefer to have a meeting outside in a nearby park area or café. We encourage the team to take up walking meetings when it’s suitable and preferable for all involved, and where it’s practical for agenda items. Walking meetings started at Young and Well CRC when the General Manager shared information about the initiative and encouraged the team to try it. A number of team members continued with it, invited other team members to walking meetings, and the practice has grown and continued. All levels of our organisation now engage in walking meetings, our General Manager being the biggest advocate. After just a couple of years, it’s hard to imagine not having them! 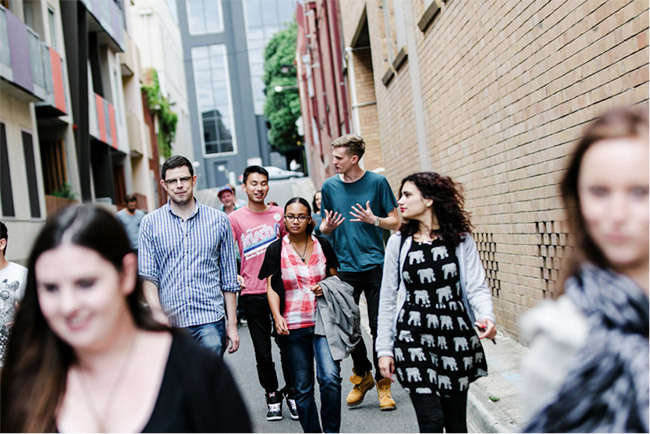 Walking meetings could be embraced by almost any organisation, using outdoor spaces in the city, or nearby streets and parks. They’re just one of many great initiatives to support mental and physical wellbeing in the workplace – and best of all, they’re free! For more great workplace health ideas and solutions, you can access the Young and Well CRC’s full Wellbeing Policy on their website. Does your organisation use walking meetings? Would you like to give them a go? We’d love to hear your experiences in the comments below!